My teaching load is pretty heavy this semester, so I’m doing much less of all of the things I love – spending time with friends, cooking, making things with my hands, blogging, and the list goes on. Still, it’s good work, a paycheck, and it makes me really present when I am able to put time into things I enjoy. Last week, in the middle of a major tech glitch in one of my online courses, a student meltdown over confronting their own homophobia, and the realization that I had scheduled papers due in all of my classes on the same day, I quit. I closed my school’s loaner laptop for the first time in four straight days, shut my desktop off for a few hours, and just thought about what I wanted to do with my sudden window of freedom…ahem, I mean self-care! 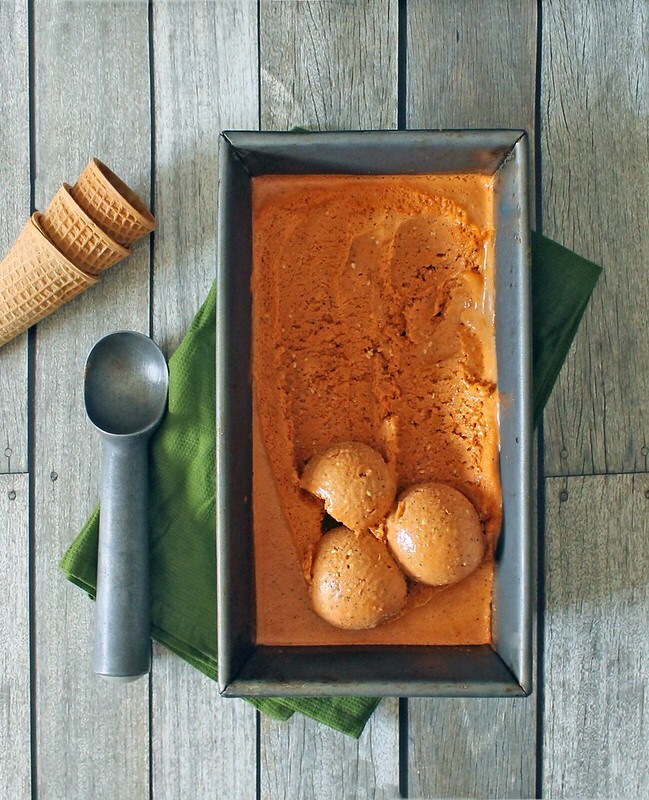 I’ve been knocking around the idea of making Thai iced tea ice cream since last summer when I saw someone’s photos on Pinterest of it. Big, round globes of soft orange ice cream, piled on top of a waffle cone – I already knew what it must taste like! As the thought stayed in the back of my mind, though, I’ve continually thought about what I could add to give it a different spin or add some texture. 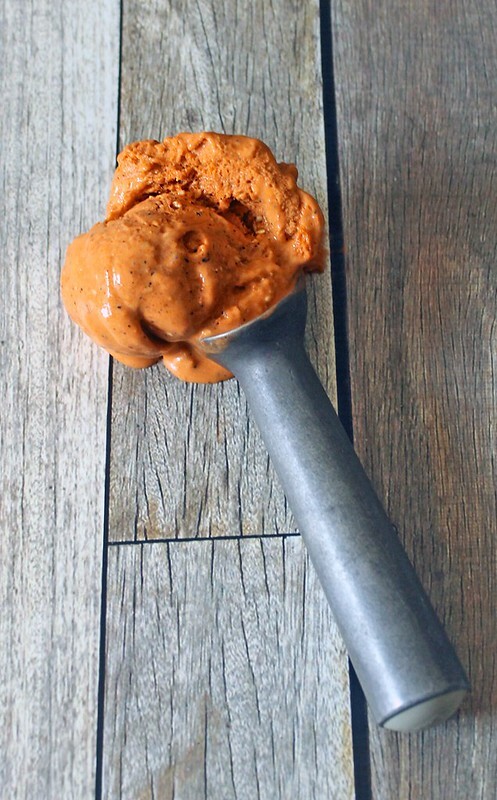 When it comes to ice cream, I’m usually a purist, but I saw so much potential here for doing a little more. I had a clear winner in mind, but when I went to my pantry in order to get some serenity last week, the cans of coconut milk I thought I’d find there were nowhere to be found. Did someone make a delicious curry while I wasn’t looking? Who’s to say? But with that idea down the drain, my eyes fell on a bag of sesame seeds I had bought a few months back wanting to make one of my favorite candies of all time – sesame brittle. Like magic, the two ideas melded and it was just the undertaking I was up for – multi-stepped so that I could successfully avoid work and give myself the break I needed and yet not so cumbersome that I’d be sorry I started halfway through. For someone not looking to cook the day away, you might want to split this up over two days, making the brittle and the ice cream base on the first day and churning and assembling the ice cream on the second. When I have the time, I prefer to make ice creams over two days anyhow because it allows the base to get really, really cold in the refrigerator overnight so that it churns faster and gets thicker once you introduce it to the machine. Since I wanted to start and finish this ice cream on the same day, I began with the base and then put it in the back, coldest corner of my fridge and let it sit there for several hours while I made the brittle, allowed it to cool, and broke it up. Breaking the brittle to the point where it is about the consistency of store-packaged toffee chips is a tough job (so is not eating all of it before you crush it), but I relied on a trusted, vintage ice crusher to do the job. You’d have just as much success putting the brittle into a bag and crushing it with a rolling pin, of course. 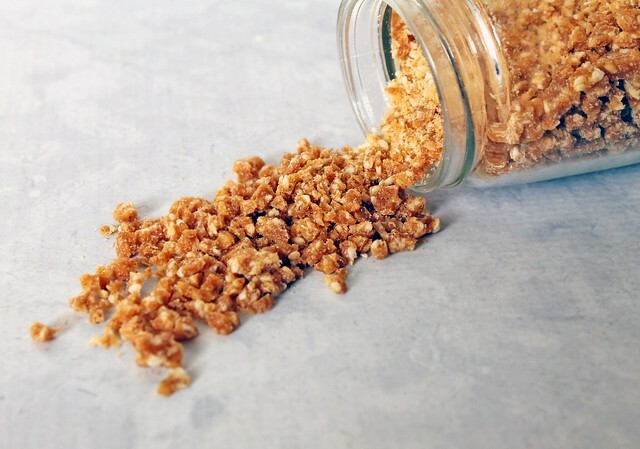 The brittle itself is nutty from the toasted sesame seeds and then sweet and caramelized from the honey. I add a little cinnamon and a little cardamom to add a some extra warmth and spice, but you can leave those out if you don’t have them on hand. The brittle is, obviously, great in ice cream, but it’s also perfect on its own. I was so bananas over it that I plan on making a bunch at Christmas and handing it out with cards. Here’s where I’d go into detail about how I accidentally semi-burnt a batch, but nibbled at it until it was suddenly gone anyway because it was sugar and butter and honey and, thus, still delicious. 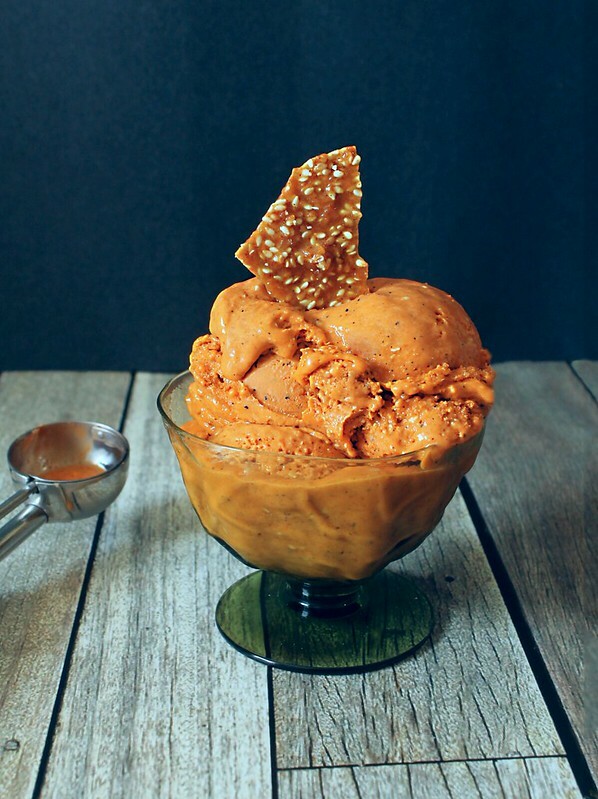 It adds a great crunch and texture to the ice cream, which tastes, as you might imagine, just like Thai iced tea, but creamier. 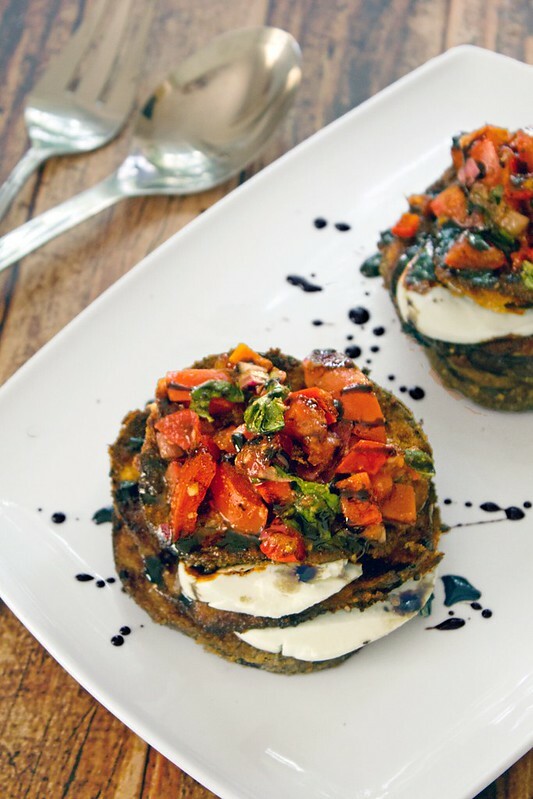 The flavor of the tea is really pronounced, but that’s what I love about this recipe. If it seems too strong to you the first time you make, go a bit lighter on the steeping time and that should help. Without the brittle, I’d worry about the tea flavor being a little overwhelming and the base not sweet enough, so keep that in mind if you decide to make this sans brittle; you may want to increase the sugar and/or decrease the steeping time. Such a beautiful, delicious dessert and one that is definitely worth the time spent. When chaos, inevitably, strikes this week, at least I’ll still have some ice cream to get me through. It wound up being just the thing to take my mind off classses and allowed me to enjoy being back in the kitchen with just an idea and some time on my hands. In a heavy-bottomed pot, add the sugar, honey, salt, cinnamon, cardamom, and water and stir to combine over medium heat. Cook for 2-3 minutes stirring occasionally, then stir in the raw sesame seeds. Cook the mixture, stirring often, until it turns an amber color. This can occur anywhere between 5-10 minutes and it is very important you not only keep watch for the color to change, but that you also use your sense of scent. When you can smell the sugar caramelizing and the sesame seeds toasting, check on the color and wait until it reaches a rich medium brown. If you have a candy thermometer, the temp should be around 300°F. Once the sesame mixture has reached the desired color and temperature, remove the pan from the heat. Immediately stir in the vanilla extract and butter. Once the latter has completely melted, stir in the baking soda. This will cause the mixture to foam up a bit, but don’t be alarmed. As you stir, and as it settles down, the foam will subside. Pour sesame mixture onto a baking sheet that has been lined with a silpat or parchment paper. For the ice cream, I like to spread it out a bit so that the brittle is about 1/8″ thick or even less. If I was serving it on its own, I’d spread it to about 1/4″ thickness. Once the brittle has completely cooled and hardened (about 25 minutes), break it into pieces and enjoy or grind it up for use in ice cream. Consult your ice cream machine’s directions and plan ahead to freeze the insert if necessary. In a heavy-bottom saucepan over medium-high heat, combine the milk and 1 cup of the heavy cream. As small bubbles form around the edges, pour in the tea leaves and stir gently for about three minutes. Remove the pot from the heat and allow it to sit and cool for about 20 minutes so that the tea leaves steep into the mixture. While this is cooling, measure the sugar into a medium mixing bowl and add the three egg yolks. Beat with a whisk until the mixture is a pale yellow and the texture is almost like a paste. In a separate heavy-bottom saucepan, add the remaining cup of heavy cream and allow to warm over medium-high heat, stirring frequently. Bubbles around the edge will form indicating it is getting hot. When this occurs, pour in the egg and sugar mixture and mix thoroughly until combined. Turn the heat down to medium and stir the mixture gently, but consistently, for about 10 minutes. You’re creating a custard here and while this isn’t difficult, your attention is key in making sure it doesn’t cook too far, or get too hot too quickly, creating a curdled texture. As the heat rises, the mixture will thicken into a custard. As soon as you sense this happening, remove the pot from the heat and continue to stir for a bit as it begins to cool down. After about 15 minutes, strain the custard through a wire sieve in order to remove clumps which may have formed during the custard-making face. Place in the refrigerator to cool down while you continue with the recipe. 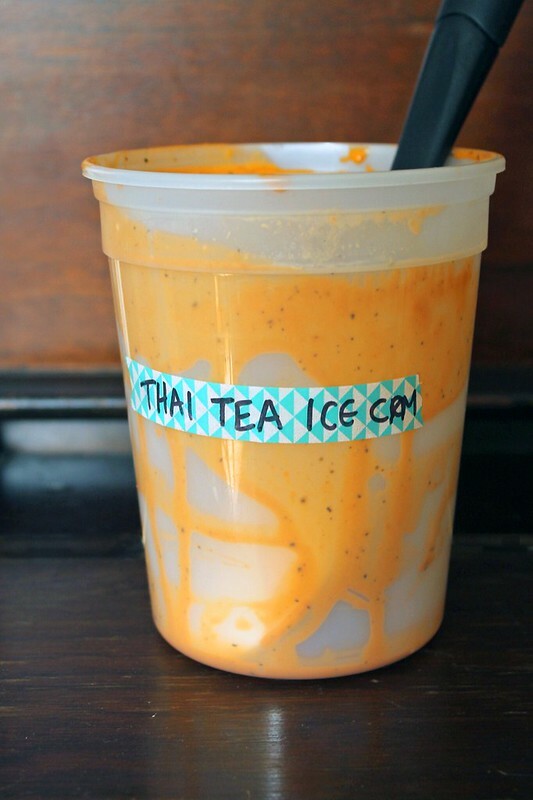 Take your pot of Thai tea and strain it. Allow this to cool as well. When both mixtures are cooled, combine thoroughly and then keep in the refrigerator for up to 24 hours before churning. 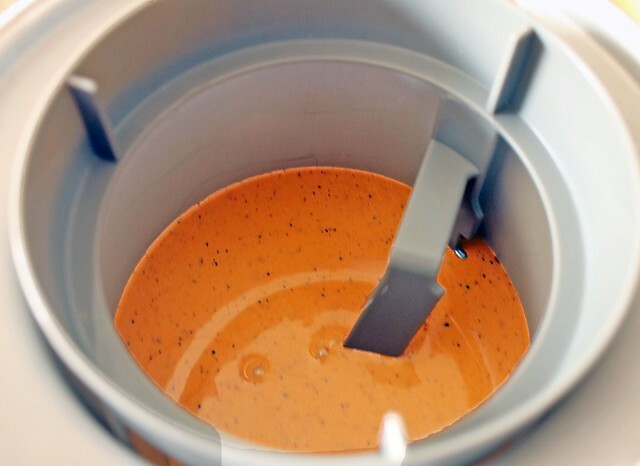 When the Thai iced tea base is completely cold, pour it into your ice cream machine and allow it to process according to the manufacturer’s directions. In the final five minutes of processing, shake in about a cup of the sesame brittle crumbles and allow the machine to stir them in. When the ice cream has finished churning, transfer to a freezer-proof container and store. I can’t believe I have to write a post about ice cream while the snow is falling outside with abandon and several inches are already under foot with more to come. Scratch that. I can believe it because I just remembered recently that on the first week of May last year, I wrote and told you all about the coconut ice cream with graham cracker swirl I was making amidst a blizzard. Oh, Minnesota, never change! 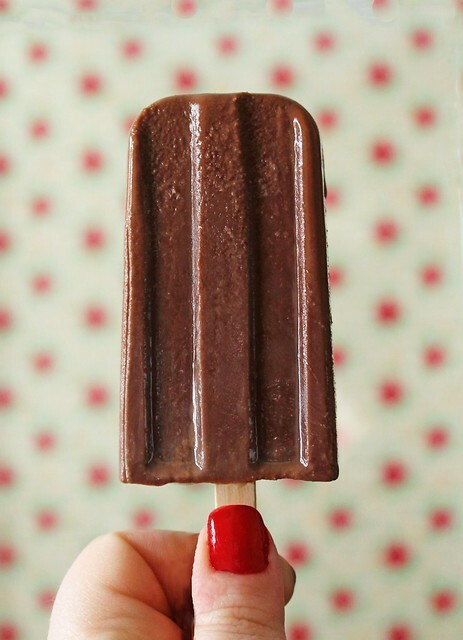 Guinness Fudgesicles are the perfect treat for those among us who love a rich, chocolatey dessert, but one that is punched up a bit by the bitter creaminess of a good stout beer. 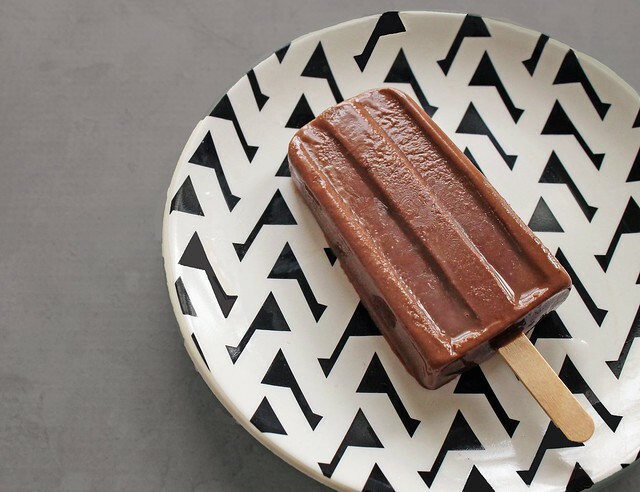 They are everything you remember about fudgesicles as a kid, but upgraded a bit because we’re all adults here and deserve a little something sophisticated with our desserts from time-to-time. It might seem, upon first glance, that there’s not a lot to these, but in a way, that’s what makes them perfect. They’re not loaded up with a lot of superfluous ingredients, nor do they require a lot of technique. There’s just a bit of melting, some whisking, a pour or eight and they’re off to set up in the frozen recesses of your freezer. For full disclosure, if you have to go and buy a bag of chocolate chips to make these, or a bottle of Guinness, you’re going to have some leftovers. Sorry about that not-a-problem. I have faith that you can handle it. In a small, heavy-bottomed pot melt the chocolate chips over low heat. While waiting for them to melt, prepare the other ingredients, checking on the chocolate every minute or so to avoid burning. When the chips have melted, add the half and half, milk, salt, cocoa powder, sugar, cornstarch, and 1/3 cup of Guinness. Stir to combine. Raise the heat to medium and cook for 5-10 minutes or until it begins to thicken. You may want to switch out your spoon for a whisk in order to make sure your mixture is free of any lumps. When it has thickened slightly, remove from the heat and add the butter. Stir in and allow to melt fully, incorporating it completely. At this point, taste the chocolate and see if the taste of the Guinness suits you. 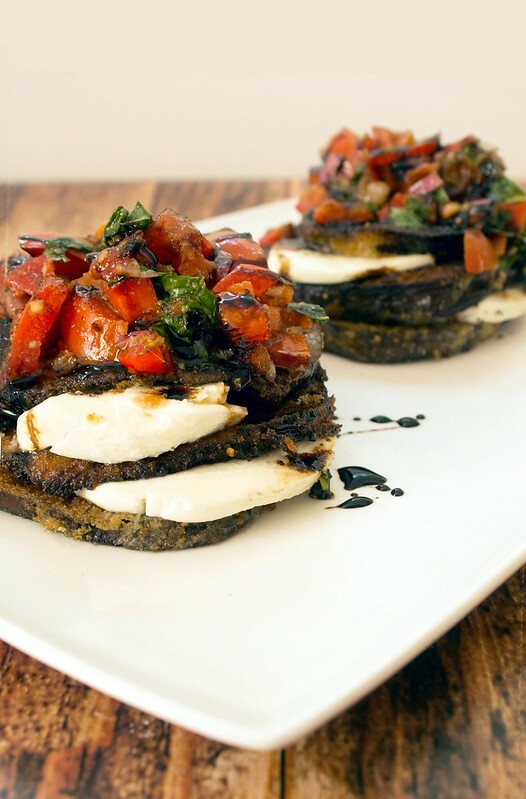 I wanted a little extra oomph, so I added 1 Tablespoon after cooking and the Guinness flavor really blossomed. Pour mixture into 8 popsicle molds and freeze for 30 minutes. Then, insert the popsicle sticks and allow to continue freezing until they are solid. Before serving, you may need to dip your molds in warm water to loosen them. If they seem a little too soft after this process, lay them gently on a baking sheet lined with wax paper and return to freezer for 15-20 minutes before serving. After all of that complaining I went and did about the length of winter, today the thermometer reached 98°F. In Minneapolis. In May. Normally, such temperatures turn me into a wild beast of a thing, but truth be told, I was only a little bit sorry for today’s heat. While the meows were seeking out cool, dark corners to lay in and Bear was putting in extra screens and moving fans around, I knew that, finally, the time had come to make this pasta dish! I’ve been holding onto the recipe from the Kitchn since it was published last October, waiting for the weather to warm back up and, more importantly, for it to coincide with the sale of mascarpone cheese! The latter seeming, at points, even less likely than spring’s eventual thaw. Being the lucky lady that I am, I found a sale on a tub of the good stuff last week, though I won’t deny tapping my foot and mulling over whether or not the time was yet nye. Turns out, it was and a sensible purchase was had! When I saw the temperature was going up this week, I knew the time was upon us to indulge. Have you ever had pasta with a sauce that is heavy on the lemon? If you’re not shy about the idea, try it. 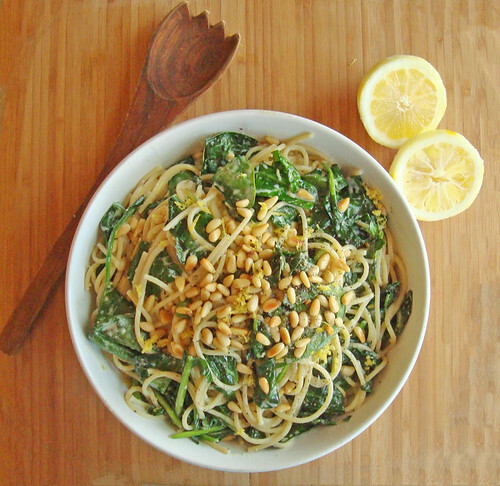 You’ll ask yourself why you don’t eat pasta with lemon-something-or-other all the time. Take this sauce, for example. There’s so much brightness from the fresh lemon juice and the lemon zest, but then the mascarpone gets stirred in and it’s creamy, dreamy with just a little bit of sweetness to take away some of that punch from the citrus. The spinach wilts into the hot pasta, so it’s soft and earthy, but again, nestled throughout this smooth, velvety sauce that gets a little kick with some garlic, fresh cracked pepper, and just the right amount of parmesan cheese. The toasted nuts join a little fresh lemon zest on top and another turn of the pepper mill. 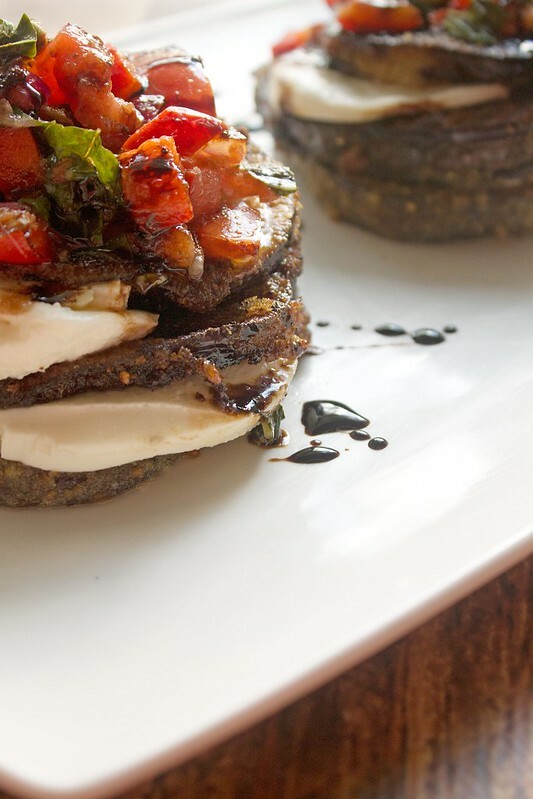 Every forkful feels like the perfect bite. It is as elegant a dish as it is easy. The ingredients are few, the method simple (and great for warm days), and the clean-up is virtually effortless. I used one pot, a bowl, and a colander only. 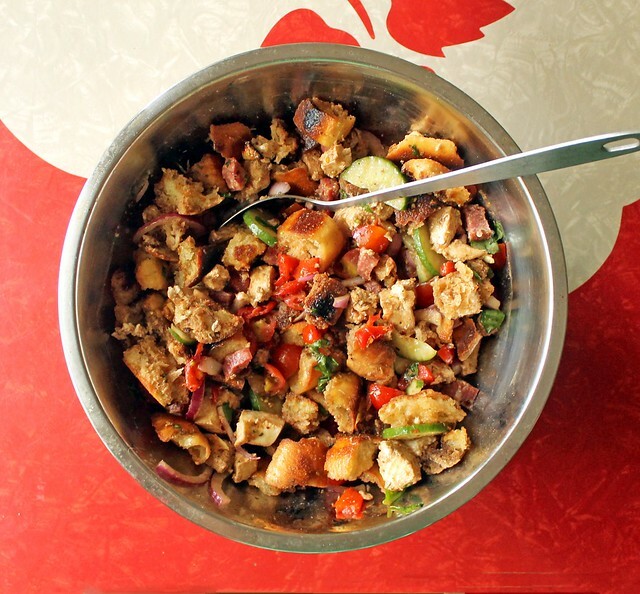 Pro-tip: Mix the sauce in the same bowl you’ll serve it in! You’ll have one less bowl to clean and, better yet, your pasta be coated by every last drop! Serves 4 as a main course; Adapted from here. Fill a large pot with water and bring to a boil. While waiting for the water to bubble, prepare the sauce. Combine 3/4 of the lemon zest, lemon juice, mascarpone, garlic powder, parmesan cheese, salt, and pepper and mix until fairly smooth. If you have a few lumps, they’ll work their way out when they hit the hot pasta. 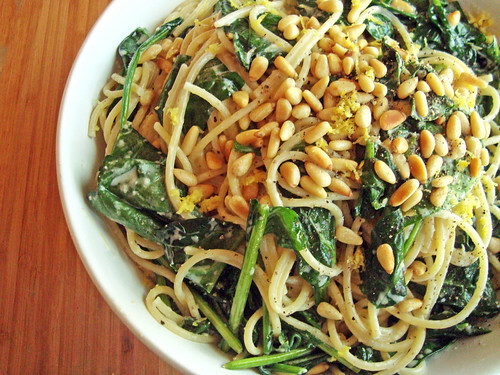 If you haven’t already done so, you’ll want to toast your pine nuts while waiting for the water and pasta, as well. Add them to a dry pan and set over medium heat until they’re are lightly browned, giving them a shake every 2-3 minutes. When you can really start to smell them, they’re done. Cook the pasta. With a minute or so left before the pasta reaches “al dente,” add the spinach. When the pasta is finished, scoop about a cup and a half of pasta water from the pot and then drain the noodles. Add the noodles to the bowl with the sauce and add about 1/4 cup of the pasta water and stir together. Add more pasta water until a creamy consistency is achieved. 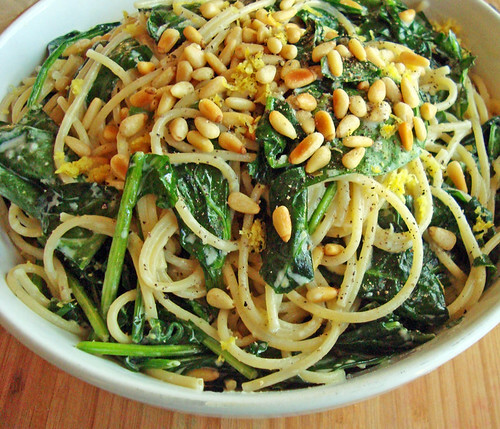 Top the pasta with the remaining lemon zest, the toasted pine nuts, and a few cracks of fresh pepper. Additional parmesan can be added, if desired. Let’s pretend it’s for real spring. Like, the kind of spring that blows in with warm days and cool nights, that lasts a few weeks before the temperatures really rise and the humidity of summer is upon us. Let’s pretend the 70-degree days of just this past weekend hung around, that it didn’t drop 40 degrees overnight, and that I didn’t, prematurely, put away the down comforter. Let’s pretend that I was able to spend part of the day outside today turning over my small gardening plot in the side yard, laying down new ground cover, and bringing home my plants from the store. Let’s pretend that it didn’t, instead, flurry this afternoon, forcing me to drag my slippers back out and abandon my pitcher of iced tea in the fridge for the hotter, steamier variety. You see, I wanted to take photos of these adorable DIY garden markers among the beautiful, green, thriving plants of a garden, but Midwestern weather and I are having a bit of a tiff right now, so that’s not yet possible. For some of you, it may have already happened, while for others of us it feels like a distant dream, but whenever your vegetable garden is planted, consider brightening it up a bit with this simple craft, no? Most of the items needed are available from your local dollar store and the rest, which can be found at a craft store, or even Amazon, will only run you a few dollars more. The best part about these, aside from being really cute and totally unique, is that a few thick coats of Mod Podge make them washable and able to stand the test of time by not peeling or chipping. They’ll last for years to come, fairly safe from the elements (I can’t yet promise that they won’t fade), which also makes them a really wonderful gift! Did someone say, Mother’s Day? I just labeled my set with a marker and some cute handwriting, but I can see using a fancy paper cutter, like a Silhouette or a Cricut (oh, how I yearn for one or the other!) to create more elegant lettering, should you have access to one. Depending on fonts, colors, and pattern of paper, the sky is really the limit in how you customize these for your own. Charlotte made the green ones below to match her manicure. How femme is that?! Since it seems I still have a few weeks to go in prepping my summer garden, I’ll be sending this batch to my mother and grandmother in hopes my good deeds will have me rewarded with some sunshine and warmth. Hopefully, they’re up for the task of growing more than tomatoes and basil this year! What’s on your list to grow this summer? 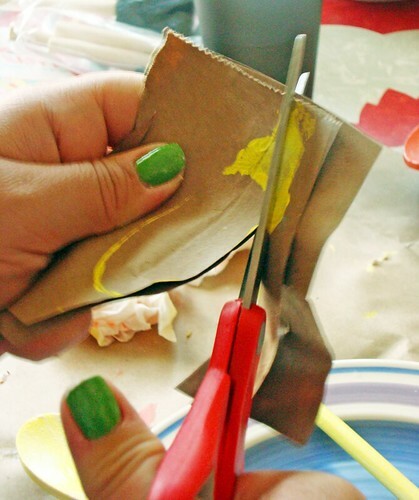 Use the outline of a wet spoon on scrap paper to create a pattern for your labels. 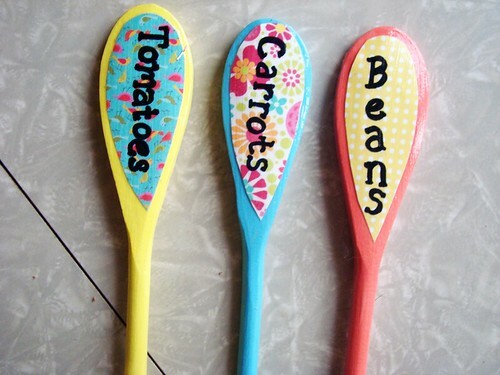 To create your DIY Garden Markers, first paint your wooden spoons with two coats of acrylic craft paint. As you finish the last coat of your final spoon, place the spoon on it’s back onto the piece of scrap paper to make a mark, as seen in the image on the right. This mark will serve as your pattern for spoons’ labels. 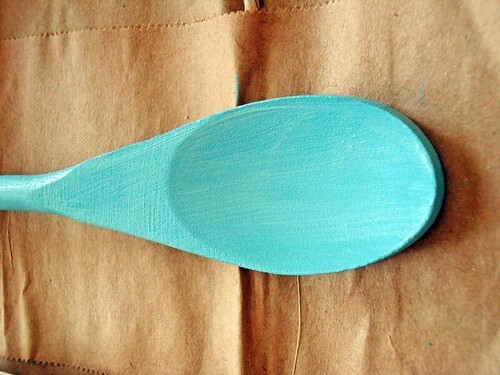 Finish painting the final spoon and allow to dry. 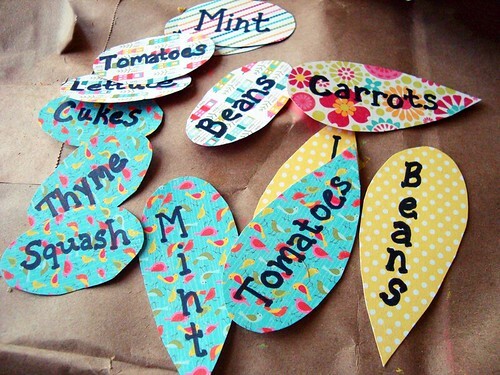 Cut out the pattern for the label and then use it to carefully cut shapes out of the scrapbook paper for each spoon. 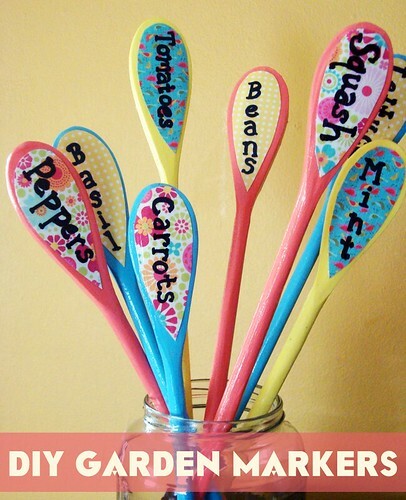 When all of your labels have been cut out, use the marker to write the name of each vegetable. 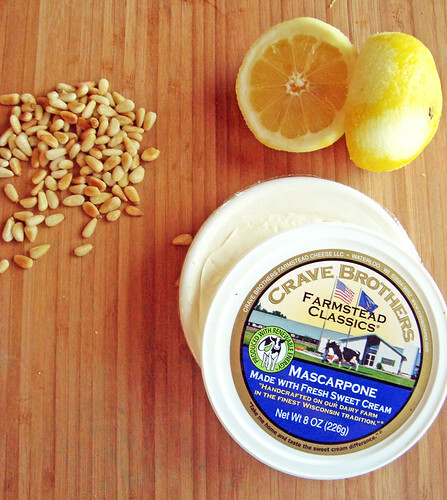 Adhere a label to the back of each spoon with craft glue, smoothing out any wrinkles as you go. After each spoon has had it’s label affixed, paint the entire spoon from top to bottom with a fairly thick coat of Mod Podge. 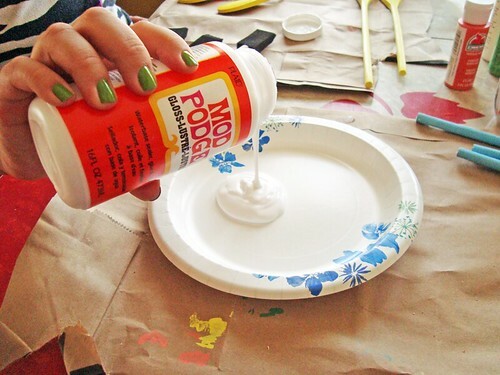 Continue applying first coat of Mod Podge to all spoons. When finished, begin again with the first spoon and apply a second coat. You will want to apply a total of 3-4 coats per spoon. 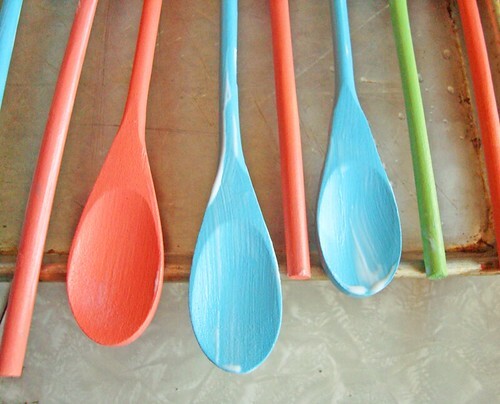 When finished, allow the spoons to dry completely. I suggest waiting at least 12 hours before using. Well, readers, here we are: one day past the week where few could escape the notion, or practice, of hard boiling and dyeing eggs, and one week further into spring where, at least in the Northeast, the days have finally been warming up a little bit. On Saturday, I walked around without my coat on for a solid 30 minutes until the sun ducked behind a cloud and I, miserably, trudged back to the car to get it before resuming the mini antiquing jaunt I took with my mom to a neighboring town. Lion, lamb, I know. This is all to say that ’tis the season for doing something with hard boiled eggs, which, when I’m faced with, always results in deviled eggs. I resisted deviled eggs until I was about 20, even though my own mother was rumored by family and friends alike to make absolutely delicious ones. When I finally gave in, I realized several things: 1) Everyone loves deviled eggs and I was totally missing out and 2) You can mix almost anything into a standard deviled egg recipe and it only makes them more delicious. So many variations can be born, which brings me to my favorite point about deviled eggs: depending on context even more than ingredients, they can be considered fancy fare or not! 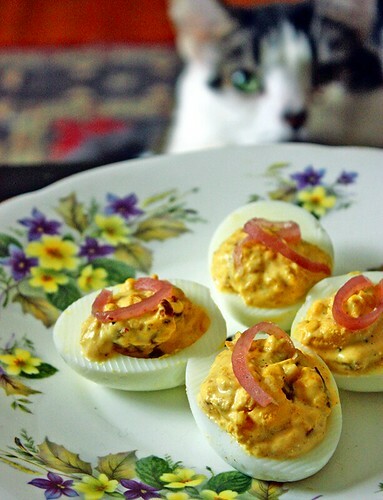 Take these bacon dijon deviled eggs (that even Ollie would, apparently, be interested in eating. Cat bomb!). On that plate up there, with their little pickled onion garnish (I have a whole beautiful quart of these to use, y’all), they look pretty enough for a tea party or some sort of shower. But put them on a table next to some ribs and corn and it’s summer in the backyard being sweaty and lazy with your pals. Deviled eggs never disappoint and this version is no exception. Who doesn’t want a little smoky, crispy bacon stirred into their eggs alongside the gentle bite of dijon mustard? That sounds like the start of a perfect egg sandwich! 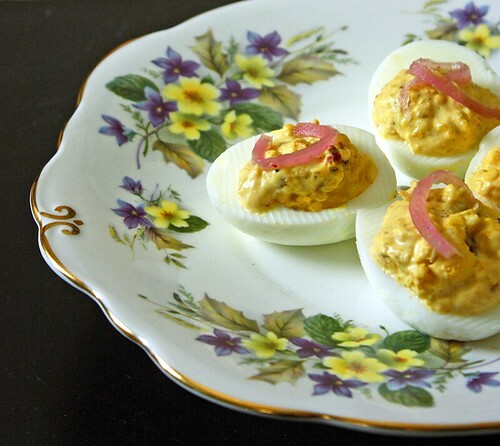 I know not everyone will be inspired to go so far as making the pickled onions, but let me just argue for the extra step by simply saying that their addition to these deviled eggs is kismet. The little burst of pickling liquid and onion juice, which so nicely cuts through the richness of egg yolk, mayo, and bacon, is a pairing that shouldn’t be missed. 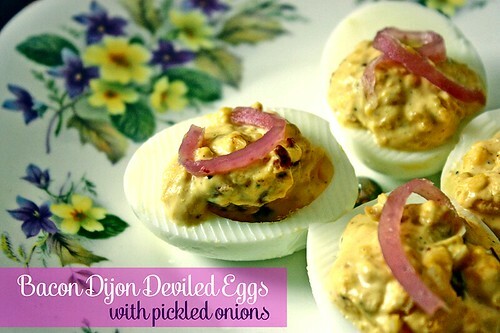 If you do forego the pickled onions, these deviled eggs certainly will not disappoint on their own; though you could always add a little slice or mince of dill pickle to the tops, which would do the job, too. Several hours before serving, or better yet, the night before, hard boil the eggs. Using eggs purchased at least a week in advance will help with the peeling process later, as older eggs shed their shell much easier. Put all 12 eggs in a heavy-bottom pot and cover with cold water by at least an inch. Add a pinch of salt to the water and bring to a boil. Once the eggs begin boiling, cover with lid, remove from heat, and allow to stand for 15 minutes. Drain hot water and fill the pot with cold water until the eggs can be handled. After several minutes remove them from the pot (which will eventually turn the water warm again due to residual heat – you don’t want this to happen!) and gently crack the shells a bit all over. Transfer the eggs to a big bowl of cold water and allow to sit until completely cooled. Pre-cracking the shells here will allow them to loosen as they finish cooling in the second bowl of water. When the eggs are cooled, crack further and peel. I find peeling them under running water in the sink helps remove the shells easily, too. When finished, slice each egg in half lengthwise, putting the yolks in a clean, dry bowl and lay the whites on the plate you plan to serve them on. 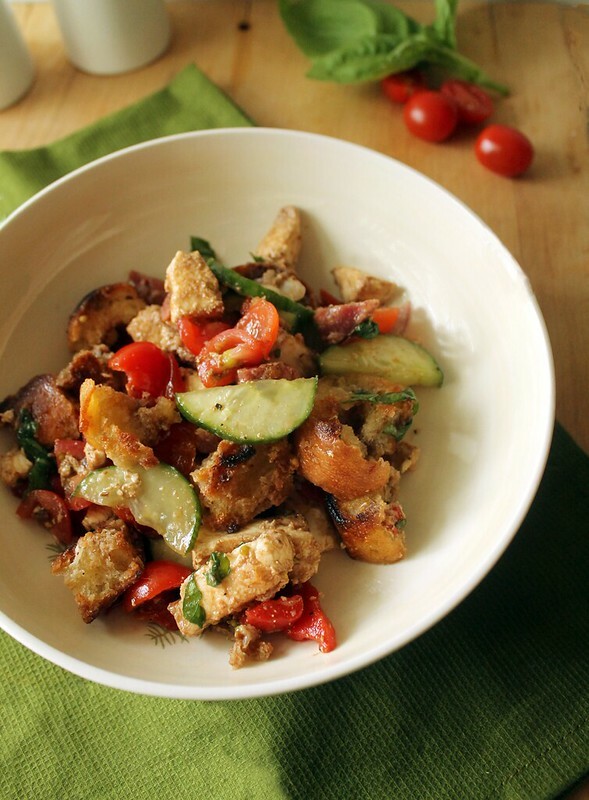 In the bowl with the yolks, use a fork to crumble all of the egg yolks. Add a small trickle of water, about a teaspoon, to the yolks to help them cream together a bit before adding the remaining ingredients. Add minced onion, salt and pepper, mayonnaise, dijon mustard, and smoked paprika. Blend until fairly smooth. Fold in the chopped bacon and fill the egg white halves. When finished, garnish each with a slice of pickled onion.